You’ve likely heard about BYU’s rugby team—the one that has won four national championships in the past decade. 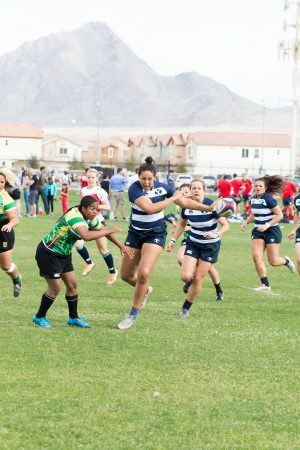 You may not have been aware that on the same May day the men’s team battled Cal for 2016 national bragging rights, the BYU women’s rugby team was also taking the field in a national-championship match—in its first season as an official BYU extramural team. And even though the newbies fell to women’s-rugby powerhouse Penn State, the game capped a meaningful season of firsts: “It’s awesome to wear the Y on your chest . . . and represent something bigger than just the club,” says team captain Jordan N. Gray (BS ’16), who also plays for the U.S. national team. Jordan Gray (left) and Jessie R. Beck (BS ’16). Photo by Erica Allen. Off the field, members of the team attend each other’s recitals, know each other’s families, and encourage each other academically. Team members even organized a special graduation ceremony for seniors who missed April’s commencement to play against Central Washington. “They call each other sisters, not teammates,” Waqa says.